The photo of an undernourished Bichon almost jumped off the page of the Small Paws Rescue newsletter. 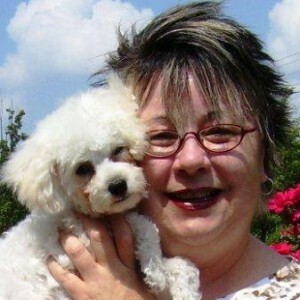 Bev VanZant has a soft spot for Bichons. She lived with a Bichon named Bailey for several years and was deeply saddened when she passed. This photo of a Bichon, named Tyler, hit a nerve. Bev, who lives in Ohio, was heading to California on a business trip. She thought she could stop in Phoenix on her way home to pick up Tyler. Tyler’s foster mom brought him to Bev at the airport hotel. “He was heartbreakingly underweight,” she says. Everything went smoothly. Small Paws asked to interview Bev’s veterinarian. Bev had to sign a contract stating that if she could no longer take care of Tyler, he will be returned to Small Paws. Bev loves the breed because she says they were created to be companions—not to hunt or guard or do any other kind of work. She also likes that they don’t shed. “I took one look at that beautiful Bichon face—with its dark eyes and black button nose,” she says. It was love at first sight. For the past three years, Bev organized online fundraisers on her blog to help Small Paws. She is hosting another fundraiser that ends March 31. This time she is giving away four flat pets. To see a flat pet, click here. Blogger Karen Nichols is also contributing one of her amazing pet portraits, which you can see here. Each breed has a rescue organization for their breed. Small Paws Rescue has over 800 volunteers and more than 6,000 members in 26 countries. They have rescued more than 8,000 Bichons in the past 12 years from across the country. To help Bev, Small Paws, and these beautiful dogs, click here. Author’s Note: You can still enter Pet News and Views contest to win a free CD of country music songs for dog lovers. Click here for details. Michele C. Hollow writes the animal welfare blog Pet News and Views.